Jointly funded by the University of South Wales and the European Regional Development Fund, the Hydrogen Centre is a focal point for new Research, Development and Demonstration of hydrogen energy technology in Wales. Located at Baglan Energy Park, the Hydrogen Centre development was also supported by Neath Port Talbot Council and the Welsh Government. Building on the University’s established research into hydrogen energy through the Sustainable Environment Research Centre (SERC), the Hydrogen Centre provides a platform for the experimental development of renewable hydrogen production and novel hydrogen energy storage. The centre enables further research and development of hydrogen vehicles, fuel cell applications and overall hydrogen energy systems. The Centre is the focal point for a series of collaborative projects between the University of South Wales and other academic and industrial partners. One of the main functions of the Hydrogen Centre is to raise awareness of hydrogen as a clean and sustainable energy carrier, with the potential to overcome our dependence on imported energy. As well as the work described on hydrogen technology, the economic and social impacts of hydrogen energy are researched at the Hydrogen Centre. 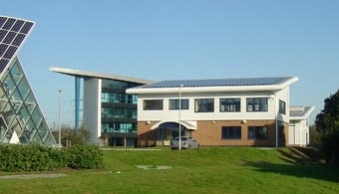 *The Hydrogen Centre was originally developed by the University of Glamorgan. The University of South Wales was formed in 2013 by the merger of the University of Glamorgan and the University of Wales, Newport.